Pink, sparkly and frilled, what more could a little princess want! Available in three sizes, to fit children from 2 to 7 years old. 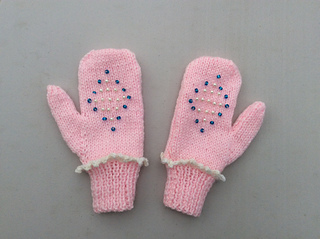 The mittens are knitted flat and seamed. Beads and pearls are used for decoration, but if knitting for small children you may prefer to omit these. 25g (25g, 50g) pink DK yarn and scraps of white DK yarn.